AIRMAIL COLLECTOR POSTAL/INTERNET AUCTION #92 HAS CLOSED. 135 unsold lots, including several high value items, are now available for direct purchase until April 27th, 2019, at 85% of their original estimate price. These can be found with their original estimate and revised purchase price, by clicking 'Search By Text' on the 'Auction' page. To purchase a lot, locate it on the 'Search By Text' page and click 'Add to Bid Form'. If the lot is still available, you will buy it at 85% of the original estimate. Full size front and back scans of all single items can be found on the 'Auction' page of this web site. Just click 'More details' below the thumb print of each lot. 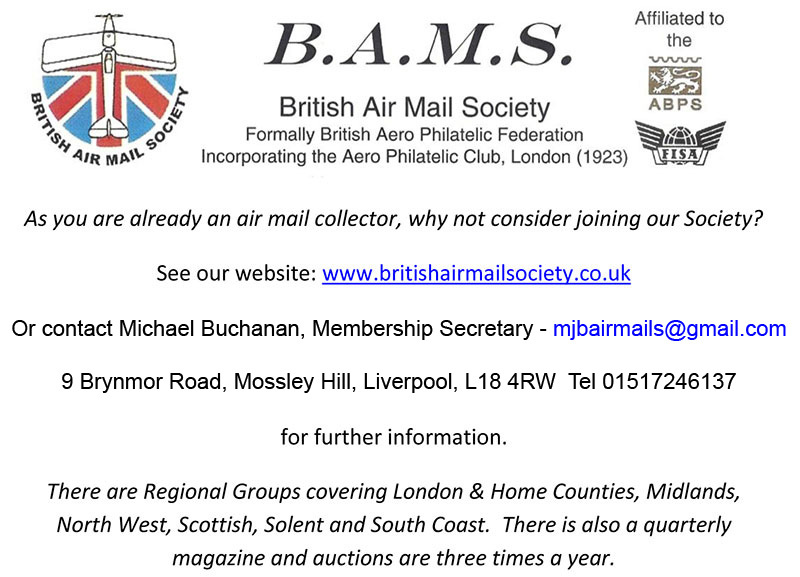 Airmail Collector specialises exclusively in the auction and valuation of airmail postal history. We were established in 1997 and are based in Cardiff, South Wales. 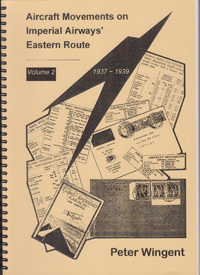 Internet/mail auction auctions are held every 10-12 weeks each with c800 lots offering a wide selection of worldwide airmail covers ephemera, literature and related works reference. Valuations for insurance, wealth management and probate are carried out by arrangement. The only qualification for posting a notice is that it is considered to be special in some way and has the potential to add to the knowledge of, and give pleasure to, fellow collectors and/or help those not currently engaged in aerophilately, but who have serious related interests e.g. 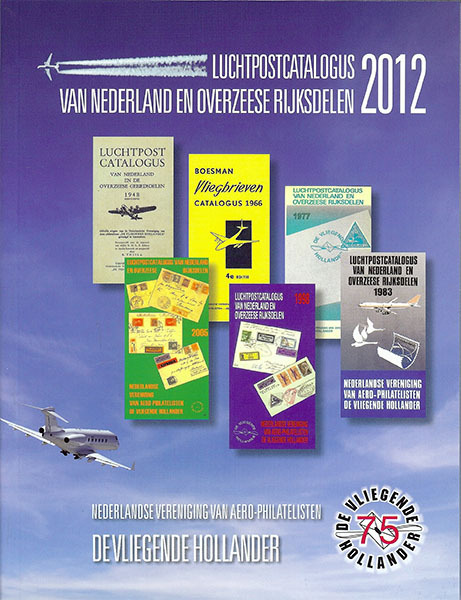 postal history and aviation, discover the its fascinations, importance and challenges. There will be no charge for posting a notice. Appearance is, in no way, intended to imply endorsement. The aim is simply to aid the dissemination of such information throughout the aerophilatelic community. Posting will guarantee a wide readership. Over the last 12 months the Airmail Collector website has attracted an average of 1000+ visitors per month. If you have produced, or know of such a work, and think that it's posting might be of value to fellow collectors, please contact us. 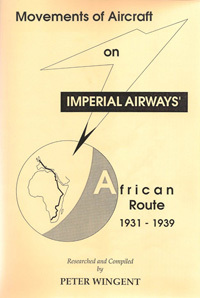 An A4 softback,175pp, containing 344 reports from the Southampton 'Southern Daily Echo' between 1936-39 presented in chronological order, 17 maps of the Empire routes, and four separate check lists for the Imperial Airways Africa, India/Australia, and Trans-Atlantic services, and the Pan American Trans-Atlantic service. Southampton is the city where Imperial Airways established its UK flying boat terminal. A valuable reference for those wishing to pursue this area of study. Furthermore each check list offers an ideal format upon which to base a new flying boat collection. 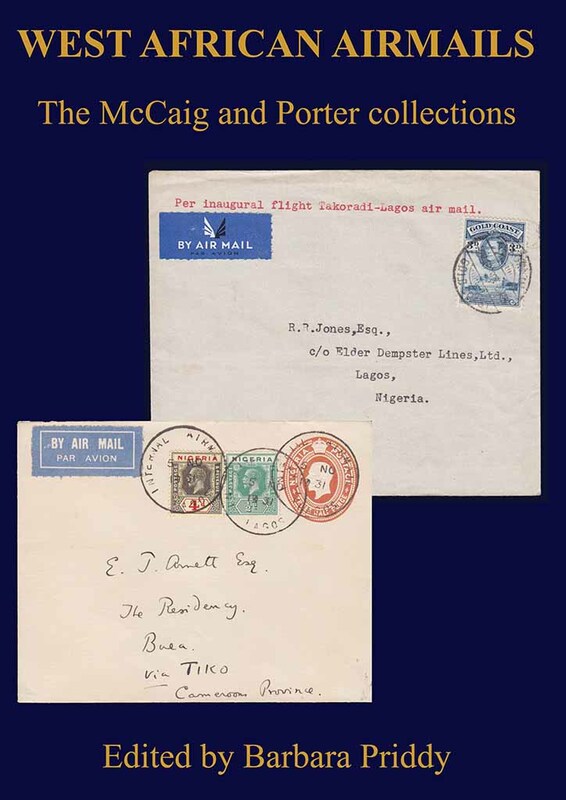 Out of print but, with the agreement of the author Peter Wingent, new copies are now available for purchase from Airmail Collector priced at £35.00 each + P/P. Out of print but, with the agreement of the author Peter Wingent, new copies are now available for purchase from Airmail Collector priced at £40.00 each + P/P. FRANCE, le service postal Aérien dans les pays d'expression française 1906-1986. The U.S. Possessions Philatelic Society is offering a CD of Geoff Brewster's serialized articles on Philippine Flights appearing in Possessions, updated through 2012. Free with membership or $15 postpaid. 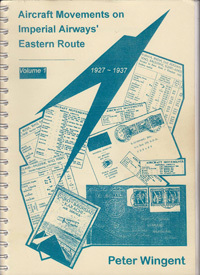 The CD includes a comprehensive catalog of PI flights from the beginning through 1946 with significant changes and updates to the American Air Mail Catalog* and color examples in searchable PDF format.